I just returned from 10 days at the glorious Chautauqua Institution in western New York. There’s so much to be said about this 166 year-old place where I annually meet up with old friends, listen to music, learn about the world we live in, and walk along the lake as much as possible. But I’ll leave that to someone else. We live simply when we’re in Chautauqua because our lodgings are very small and we are limited to the clothing and “stuff” we can get into our luggage. I love to cook and I’m willing to make it part of my daily vacation routine. But I found myself in small ill equipped kitchens with limited refrigerator space. Despite this we were pleased with the meals we created while away. If nothing else, we were happy to skip the lackluster pizza by-the-slice-and greasy offerings from the grill. There aren’t many restaurant options at the Chautauqua Institution … it’s not about the food after all. Before we left our little attic kitchen we were able to consume all our fresh groceries and give the remains of our canned goods to the local soup kitchen. I hate waste so this made me very happy. My way to avoid waste at home is to freeze things for future use. But after our time of careful shopping and cooking I found myself slightly appalled by my over crowded freezer. In comes Nupur with a clean-out challenge. Talk about timing. I always try to bring part of my Chautauqua experience home with me so this year I’m bringing home “eating better and not buying groceries that exceed our need”. I’m going to start by drawing down on our current stock. Let the draw down begin. Today’s challenge: farro, homemade vegetable broth, and frozen unpeeled shrimp. I’ll let you know what I come up with. Summer is here. I can feel it. Yesterday, I tasted it. The first of the stone fruits showed up at a small temporary fruit stand on Woodside Road. Cherries. Warm, round, juicy, and sweet. I hadn’t considered cherries a stone fruit until the bubbly young woman selling them referred to them that way. I always put cherries in a separate category, with their own special short season. They come earlier than the other summer fruits and are usually long gone from produce stands and grocery stores by the time beautiful ripe peaches were easy to find. I remember the vans, tents and stands that showed up briefly along the Sonoma Country roads we sometimes traveled when I was growing up. Where were going? I don't know anymore but I vividly recall one cherry seller with van he always parked under the same grove of Eucalyptus trees. A hand painted sign boasted “fresh cherries” and "ice cold cherry juice" but we never stopped. Who can blame my parents? Maybe we had to be somewhere or they were worried about somebody's bedtime or naptime or mealtime. But once I had a car of my own, I went searching for that van. Despite the fact that it wasn't cherry season I hopped in my brand new 1983 Toyota Corolla and went looking for a familiar grove of Eucalyptus trees with a beat up van parked in the shade. I found it. "Ice Cold Cherry Juice" was the only offering that day. I bought myself a large bottle and drank it on the spot. The color was rich and deep and the juice was not too sweet. It was refreshing and delicious. The road takes a different curve in that spot now and the Eucalyptus trees are gone but I still catch myself looking for that van when I find myself driving through Sonoma County. Happening upon that stand on Woodside Road yesterday was the next best thing to finding that long gone van. I’m happy I was able to rise from the cloud of a serious cold and that my schoolwork was behind me so I was able to leave the house and do a few errands or I would not have seen the inviting “today's pick” tent that popped up in Redwood City yesterday. I’m thankful for the hardworking young man who drove the freshly cherries picked all the way from Escalon, California so his girlfriend could sell them and I could enjoy them. And, I’m so glad FS shared the image of the first cherry growing on the tree at the Outlook Inn because it got me ready for the tastes of summer. 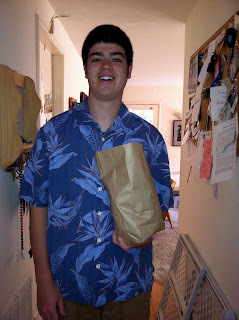 I'm very happy that the once resident teen has returned home from his first year of college. Surely the best sign of summer's arrival. I made school lunch for the last time today. And I cried. I didn’t cry at Senior Volleyball Night, the St. Pius Baccalaureate Mass, or the Mother/Son Walk at the Serra Fashion show but this morning standing in my kitchen staring down at the last bolillo, the bowl of tuna, and block of cheddar the tears simply rolled down my cheeks. I had known for years those big events were coming and I carried a freshly laundered vintage hanky to each one because I was sure I’d be reduced to a puddle of tears. At that moment I wanted something beautiful, dainty and dignified in my hand but the tears did not come. But this morning I was in my jammies and slippers searching for a hanky or tissue. I’ve made hundreds of lunches sometimes with pleasure, occasionally with a little resentment but mostly by rote. Have you ever driven to a familiar place and when you arrived you didn’t really remember the drive? That’s what school lunches were like most days. 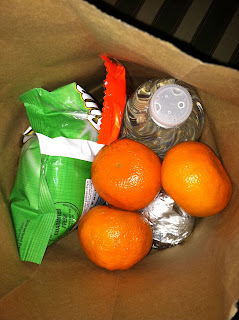 Andrew wanted the same thing every day: tuna on a roll with cheese, fruit, water, and a bag of Sun Chips. He’d be pleased to find string cheese, cookies or another treat but didn’t miss them if they weren’t there. When he was practicing for volleyball, wrestling or football he needed more so there might be an extra peanut butter sandwich or granola bar. Making his lunch didn’t take much thought or time and I did it almost everyday for the last 13 years. I did change things up now and then with some hits and a few misses. Turkey was favored for a while, he liked it and it didn’t make his backpack stink the way the tuna did. But before too long he missed the tuna and it was back to Costco for the multi-pack. Leftover pasta and pizza were a welcome change especially once he got to high school and had access to the cafeteria microwave. At one point, in a fit of independence, Andrew made lunch for himself but that didn’t last long. There was the bagel and cream cheese phase, the Top Ramen phase, and the “I don’t have time to eat” phase. There was the year in grammar school he got hot lunch almost every day until thankfully he grew tired of it. He’ll tell you that was the year he was heaviest and got sick the most due to the poor nutrition. He might be right. I didn’t want to make a big deal out of the last lunch but I did stick in a Reese’s Peanut Butter Cup as a special treat. I placed the brown bag next to the door, in “the drop spot” like always and wiped away the tears before Andrew was out of the shower. As he was getting ready to leave he said, “I don’t really need a big lunch cuz were having pizza in Hudleson’s class”. He spied the Reese’s cup and pulled it out to leave at home for later and took the rest. It was just like any other day, I’m not sure how much of it he’ll eat or if he even needs it but it’s there if he does. I insisted on a picture. I guess I did make a big deal out of it. I’d like to thank the resident teen for indulging me. Who needs a pizza stone? The January 2011 cover of Sunset Magazine promises “Pizza in a skillet … and other one-dish wonders” and there’s a photo of “Luscious & low-fat: Easy broccoli rabe skillet pizza” to whet your appetite. I’ve made the broccoli rabe version once or twice and it is delicious. But it’s this easy skillet technique that I’m most excited about. Pick up a package of whole-wheat pizza dough from Trader Joe’s and use whatever you have on hand to top your pizza … it’s fast and economical and you can please everyone with a custom pizza. Fancy or finicky, everyone’s happy. Follow the Sunset recipe directions for preparing the dough in the skillet and cooking in the oven but top anyway you like. Here’s how I topped the pizza most recently: spread about ¼ cup of char-roasted cherry tomatoes on the crust, sprinkle with a cup of shredded Italian cheese mix, 1/3 cup of sliced roasted red peppers, and 8-10 baby artichokes blanched in salted water with 1 teaspoon of dried Italian Seasoning and cut in halves and quarters. Sprinkle with some crushed red pepper and coarse sea salt just before serving. Disclaimer: I work as a Recipe Tester in the Sunset Test Kitchen, but I am not compensated for this blog or for endorsing Sunset Recipes. Because of the time I spend with these recipes, I am familiar with them and confident about the results. That is why I often turn to Sunset when searching for recipes or ideas. Are you a fan of Armistead Maupin’s “Tales of the City?” Can you name Mary Ann Singleton’s favorite Swenson’s ice cream flavor? Yep, Swiss Orange Chip but I swear I liked it first. Maybe the upcoming musical at A.C.T. inspired me too. Combine flour, sugar, cocoa, sugar, orange zest, butter, and salt in the bowl of a food processor. Pulse until the butter is the size of a pea. In a bowl or measuring cup with a spout whisk together cream and egg, processor is running pour into flour mixture. Process just until the dough comes together. Press the dough evenly into a 9-inch tart pan with a removable bottom. Put a piece of parchment larger than the tin over the dough, extending above the pan. Fill the parchment with pie weights, beans or rice. It gets tricky here because a standard crust is baked until golden brown but that test doesn’t work with chocolate. Make sure the crust looks and feels baked but doesn’t smell burnt. Bake for 20 minutes with the weights in, remove the weights and cook another 10 minutes until the bottom is fully cooked. Cool completely on a rack before filling. Whisk together ¼ cup cream and 1/8 teaspoon orange oil, set aside until needed. Melt butter in a small saucepan over medium heat. Add sugar and corn syrup, using a silicon spatula stir gently until sugar is melted. Once melted only stir to avoid hot spots, remove from heat when cream turns a light to medium tan color. The sugar and corn syrup should be over the heat about 4 minutes. Whisk cream and oil into the hot mixture. Cool slightly, pour into cooled crust, and tilt to coat crust evenly. Chill in refrigerator to set caramel. Place chocolate in a heatproof bowl. Heat 1 cup cream and ¼ teaspoon orange oil to boiling and pour over chocolate. Let sit for about 30 seconds and stir gently until combine and the chocolate is melted. Add butter to chocolate, one piece at a time, until butter is melted and completely integrated and mixture is at least room temperature. Stir gently to avoid bubbles. Pour over caramel layer and return to refrigerator to set. Peel and section oranges over a bowl (See link to technique below). Once the ganache is set, lift the sections from the juice and place around the edge of the tart, on the ganache just inside the crust. Add 1 tablespoon of orange juice, use the juice left from the sections and add water to reach 1 tablespoon of liquid, if needed to marmalade and melt in the microwave. Drizzle over orange sections. Return to refrigerator to set glaze. The tart should not be refrigerator cold when cut and served. Once again, it’s Friday and time to post my latest attempt at one of Dorie Greenspan’s recipes from her book, Around My French. This savory quick bread (pages 34-36) came together as easily as promised. I sampled this bread each of the ways Dories suggests. I had a slice when the bread was still warm from the oven. Once the bread cooled I cut up a few cubes and invited a neighbor over to share the bread and a glass of wine. The bread was good but the conversation was better. My favorite way to eat this bread was lightly toasted and buttered. The cheese is both grated and cubed. The grated cheese gives the bread it’s flavor and the cubes provide a toothy cheese texture because they don’t melt completely. This is a great technique. I want to try it in quiche next. I made the cubes very small but next time I’d like to make them a little bigger and see how it changes the bread. 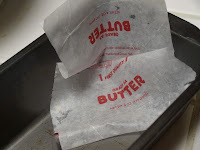 Kitchen tip: keep butter wrappers that have a fair amount of butter on them. Fold the wrapper over on itself to keep the butter fresh until needed to grease pans or cookie sheets. Instead of optional cayenne I added a dash of Tapitio to the milk. Used some sliced toasted almonds I had on hand in place of walnuts. About 40 minutes cooking time. Visit French Fridays with Dorie to see what everyone is doing with this recipe. FFwD: Dorie Greenspan’s "short ribs in red wine and port"
It’s another French Fridays with Dorie. This week’s dish was started on Wednesday, finished and served on Thursday but not posted until Saturday. Things got busy. Dorie Greenspan’s recipe for “short ribs in red wine and port” can be found on pages 254 & 255 in her book around my French table: more than 300 recipe from my home to yours. They’re predicting snow in San Francisco. Could there be a better night to come home to short ribs? Most of the cooking for this satisfying meal was done the day before which made for a relaxing dinner prep after a long day at work. The overnight chill allowed for a quick and easy removal of the fat. Broiling the meat and heating the sauce filled the house with a warm earthy aroma and just the slightest hint of Asia. The meat was tender and flavorful and the sauce was thin but velvety rich. In the recipe Dorie warns the sauce will be thin so I wasn’t worried as I warmed it on the stove. Served the short ribs with mashed potatoes and peas. Well received by resident teen. 11 short ribs, about 4 inches each weighed close to 6 pounds. I had the butcher cut them in half because I like them small and it looked like they weren’t very big in the photo. Vegetables got soft but never really browned. The pot I used (yellow Club Dutch oven) was deep and narrow; wonder if there had been more surface space would the vegetables have browned? Keep an eye on meat while under the broiler. Meat, fall off the bone tender. Plenty left, will freeze some for future dinner. Hope it holds up. Would make again but be sure to allow 2 days. Store meat, sauce, and gremolata separately for tasty leftovers.